This feature of modern consumer editing software is probably one of the most prone to marketing hype and useless “gee whizz” promotion of all of them. Most editing programs will have a layout that generally looks like the image above. There will be a screen at the top (left or right) to preview files and your project. There will be a section next to that where you will see the library or the tools of the module you are in at any given time, audio tools, special effects, transitions etc. At the bottom you will see a series of tracks where you can load video files, audio files, still images or any other assets that the software accepts as part of the editing process.. These are the “tracks” that are being referred to by the manufacturers in their materials. There is a wide variation in the way they are presented and what you can do with them. Some products allow you to use any track for any type of file, some designate certain tracks for only one type of file and other tracks for other types of file. Either way it doesn’t really matter because most of the programs on offer these days have more than enough of any type of track to satisfy the average user. However this is where the hype comes in. And of course because many people don’t really know what that means it all sounds totally cool! The truth is that if you had, let’s say, 15 tracks available and you used them all then your project would look ridiculous! It would simply be layer upon layer of video, overlays, transitions, music, narration and on and on! It would be a complete mishmash of things flashing on the screen and flashing at you through the speakers! To put all of this in perspective let’s build a virtual video project and show you the number of tracks you would realistically need. Of course we need one track for the main video itself so let’s say we have added that to the timeline in the first track and we have cut out all the bad bits and have the general outline of the project in place. The first thing we want to do is to add transitions between scenes so they blend well and move smoothly from one scene to the next. To do this we need… no more tracks! Transitions will sit on track one in between our original clips. However because we want to get a little fancy we will now add some overlays. An overlay simply put, is the ability to have your main video in the background and have another clip visible on top of it. It is that split screen effect or the “picture in picture” effect you have seen on TV and in movies and if you watch TV news these days you will often see this in action. The main track is the person on-air, then you may see a ticker tape readout running across the screen below with text information, the station logo at the top right and a shot of the “at the scene” reporter getting ready to make a report. This is all being achieved by using overlays. Overlay tracks are a great tool but as is the case with any tool, it is a means to achieve an effect, not an end unto itself. So for our little project let’s imagine we are making a video to be seen on a very big screen so we are going to split the screen into four in some places. If this was a smaller screen then this would simply look silly because the audience couldn’t clearly see the four individual sections of the screen… but hey! Let’s go crazy! To allow us to have our screen split into four we need three more tracks so now we are up to four tracks being used and we have already… a very busy screen! Of course the original video has it’s own audio so we don’t need another track for that but we are going to add some music in the background so that’s another track… now we are at 5. Some of the audio in the original clips is bad in places so I want to mute that sometimes and add some narration so I need another track for that audio… up to 6 tracks now. I also want to add some special effects but they are applied to the existing clips already loaded so I don’t need anymore tracks for that. However I do want to send this video to my Grandmother who unfortunately is old and very hard of hearing, so I think I will add subtitles in another track. Now we are up to 7 tracks used. Of course we don’t want to just start the video from nowhere and then end it without giving ourselves credit for our cinematic masterpiece do we? So we had better add some opening titles and ending credits to the project and this will cost us the princely sum of one more track. Up to 8 tracks now. Finally, because I totally lack imagination and cannot right now think of something to stuff into another track let’s just add one more for good measure and no particular reason! So that’s it, even at the most complicated point of the project we only used 8 tracks in total. 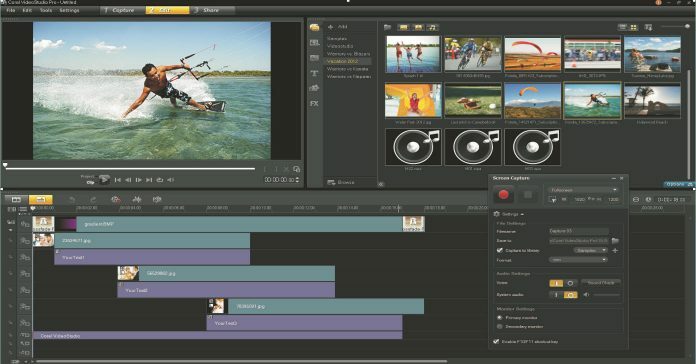 Most of the current batch of video editors have at least 15 tracks and some go up to 99 so as a point to consider regarding choosing a suitable product the number of tracks is close to irrelevant. Within the features of the video overlay tracks you should look for the ability to crop and re-size the overlay easily. Also a key feature that many miss until it is too late is that there must be the ability to add transitions to the overlay track as well as the main video track. Sometimes when creating a picture in picture effect you want the lesser picture (video) to cross fade to another video or fade to black instead of just suddenly appearing or disappearing. If you can foresee using captions or subtitling in your video editing, some video editors include subtitling as a separate feature offering a high degree of control. Others offer subtitling as part of the video overlay feature and these are usually just as effective but offer less control. In the case of the ones offering subtitling as part of the overlays you can usually achieve the same or similar results but the downside is that it often takes a lot more time to achieve those results. That’s about it for editing tracks, vital to have but not vital to have in overwhelming abundance!